Glut with vivacious joy the heart of your dear one by bestowing the person with this Luring Lushness Gerbera Assemblage and carve a cozy corner in his/her heart. This is an exciting Assemblage of fascinating 7 Red and 8 White Gerberas arrayed together in a dainty Glass Vase. Hand-pick this Glazing Grandeur Gerbera Assemblage as a date-special gift for your loved one and imbue the person�s mind with profuse elation. 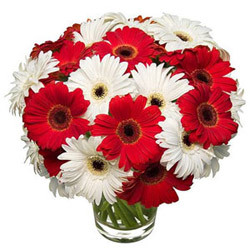 This is an exciting Assemblage of fascinating 10 Red and 10 White Gerberas arrayed together in a dainty Glass Vase. Hand-pick this Glazing Grandeur Gerbera Assemblage as a date-special gift for your loved one and imbue the person�s mind with profuse elation. This is an exciting Assemblage of fascinating 15 Red and 15 White Gerberas arrayed together in a dainty Glass Vase.